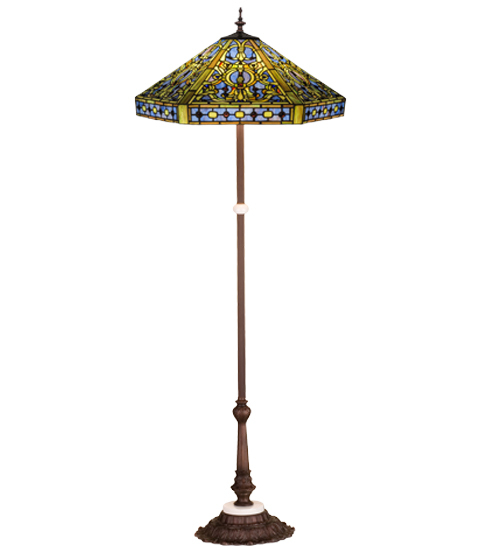 Description: The Elizabethan shade recreates Louis Comfort Tiffany's original pattern inspired by stained glass used in castles and cathedrals during the reign of Elizabeth I, of England. These motifs, also used in German and Flemish ornamentation, complement a fanciful interlaced mosaic design of Moss Green, Cobalt Blue and Amber glass and accented with Amethyst jewels and banded with mottled Violet art glass. The floor lamp base features a Mahogany Bronze hand applied finish.